I don’t think that turning pointed anger and discrimination against any group is acceptable at all, perhaps because it supposedly goes against the PC ideals I would have thought, and also because most white working class men, and the broad mass of working class people in general, are, and have been historically, the victims of injustice and bear the brunt of economic downturns. In short, two wrongs don’t make a right. Promoting one prejudice as acceptable, under the guise of challenging many others, is also unjust, anti Christian, and actually perniciously is playing economically marginalised groups off against each other and getting them to blame each other, and accept in the end that one group prospers at the expense of another, which whether true or not, is disgusting and unfair and borders on a kind of fascism, rather than left liberalism which many of those who are PC would earnestly claim to be. Any intelligent and honest person can see that PC has taken on a life of its own and is merely giving very vocal groups, and the political establishment, the self righteousness to challenge everyone else’s right to free speech and a difference of opinion and actually to close down any kind of debate. That is anti democracy, anti free speech, anti freedom and dividing people up. Again, the very opposite of what the PC thought police would claim. We all know the reality of it though, I suspect. At least, those of us who think for ourselves. · An acknowledgement that the white male dominant culture has been oppressive. The Silencing of Dissent & Debate, the End of Democracy? One thing that we should all be concerned about is the reality that those espousing a claim to be tolerant liberals are becoming dangerously more and more anti democratic, anti free speech, almost regardless of whatever is said, and there seems to be in the air the feeling that that mob mentality, which it is, is almost waiting for someone at any time, at any place and in any way to say something, even in a slip of the tongue or an off the cuff joke, who is then to be pilloried and tried by a jury of those hungering for a victim in the most unfair and nasty way by a baying mob that sometimes sounds like it wouldn’t be out of place in revolutionary France, or acting like the worst kind of racists and ‘gay bashers’ and ultra right wing and ultra left wing reactionaries. Ironic really. 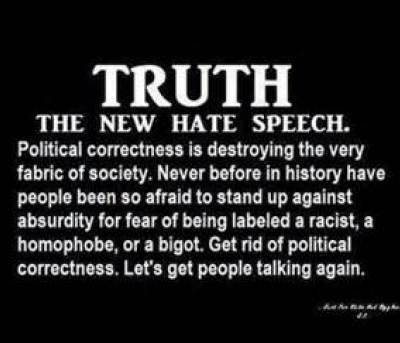 Some of the PC faithful are acting as intolerantly, obviously in speech, as the racists, homophobes and the sexists they claim are utterly intolerant. It can be the classic mob mentality. It is not about equality where I’m standing from, it is merely in some cases all kinds of nasty and unprincipled individuals jumping on a bandwagon to hate, despise, offend and hound off the air or out of jobs anyone who says anything that is deemed unacceptable, and perhaps someone who says something that secretly some of the PC faithful wish they could say but wouldn’t get away with. It is classic censorship of the unfocussed, the unprincipled, the angry and those who want their day in the sun, but in all the wrong ways and mostly for all the wrong reasons. It all started so well, how is it now ending so badly? What’s probably the most ironic of all, is that in all the cries for equal rights, equality, racial equality, women’s equality and so on, the economic divisions in the UK particularly have widened to levels not seen since the dreadful and desperate economic hardships of the 1930s and as reported perhaps even as bad as it was a about a hundred years ago. The economy seems to work very well for the very richest, fairly well for the affluent middle class, and not very well at all for those at the bottom of the economic pile, be they white, black, Asian, the broad mass of the working class and immigrants. So, for all the talk of equality, and it getting louder and more urgent, there has been a reverse in economic equality, educational opportunities for poorer people, a rise in insecure and low paid employment, austerity imposed on those who can least bear it and it’s now almost impossible for aspiring working class people to pull themselves up and move on. So, is PC just a smokescreen for destroying working class communities, tea and sympathy in effect, but no real concern for anyone or from anyone who could do something about it? I do truly wonder. One of the problems that is perhaps less obvious with the whole PC movement, is just exactly what the definition of equality really means. On the surface, the vast majority of people would assume, I assume, that equality means just exactly that, equal rights before the law, equal access to educational opportunities, equal access to jobs, equal treatment in all ways that iron out the differences in a divided society. Because, of course, if there is a push for equal rights and often in such a vociferous and vocal way, we are of course saying that the UK is very far from equality? I would assume so, anyway. Well, that would be the argument for equality, of course. But more sinisterly, the idea of equality has become confused with the idea that we should all be the same in some unexplained way, and that the loudest and most aggressive group will dominate. So, simply put, ‘equality’ begins to become everyone having to think the same thoughts, be the same, accepting the same things, disagreeing with the same things, and where all original thought and particularly independent honest opinion is derided, denounced and clamped down on, obviously if it is seen as Non PC. This is similar in principle to how right wing fascism works and also totalitarianism communism, where a person subsumes their individuality to some notion of a collective political ideal and the individual doesn’t really matter anymore. Such enforced conformity eventually needs an outlet and a target to attack, to strangely enough give vent to peoples anger at having to conform in the first place. 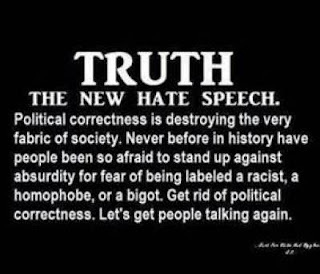 It is why we need to replace PC extremism with the democratic right to free speech, so we can criticise and healthily debate with whoever wishes to censor anything which is seen as unacceptable, starting with the increasingly nasty and intolerant and unacceptable notion of PC itself. The biggest irony is the intolerance of tolerance and the fascism of the majority against those who refuse to fit in, or just don’t fit in or have a difference of opinion. Isn’t that what PC was originally challenging in the first place? This is far more than an appendage to the whole argument presented here, but I can tell you straightaway that Christianity, and the practise of Christian faith, is really in no way compatible with PC. It may seem to be, with the PC stress on anti racism, anti sexism, anti homophobia and so on, but there are irreconcilable differences. Christianity is a complete lifestyle, where the emphasis is getting yourself right with the divine help of an infinitely wise, all seeing, all knowing and all powerful God. Instead of trying to change the world, we are really transforming ourselves first. PC is really the opposite. It is assuming that by saying continually you are non racist, non sexist, non homophobic and so on, that you then have the right to persecute others who are not demonstrating the same zealousness as yourself. It has now become a persecutors charter, to supposedly challenge the persecution of others! 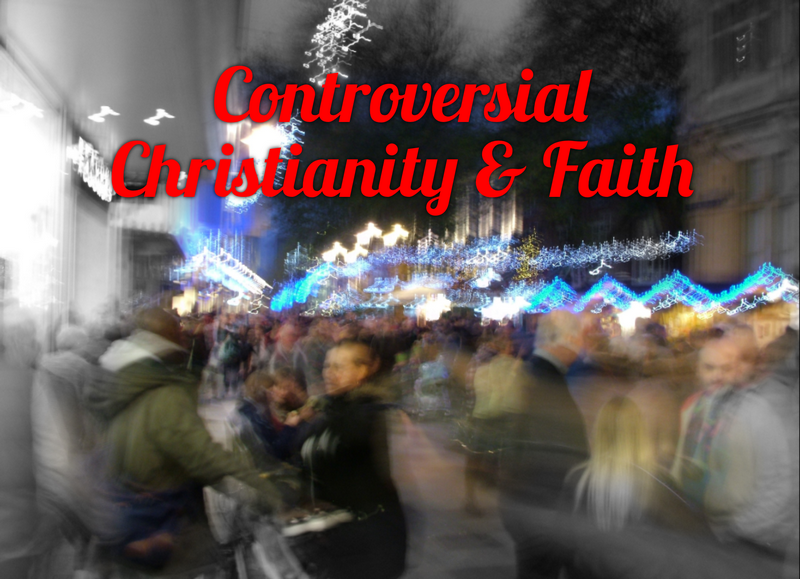 It is then, a muddle of contradictions like most human secular faiths become sooner or later. I may add, that when PC is on its way out, or a massive backlash finally sees it off, the majority of those voraciously clinging to it now and the power it gives them, will be the first to disown it by saying something like “I was never really into it, I stood out from the crowd, whereas all my friends were so PC, and so intolerant!”, but they will know the truth of it. I have come to realize that most pc people are self-absorbed hypocrites. This statement that you shared seems to sum them up very well and is what I have seen happening and why I say they're self-absorbed hypocrites,"Is silencing free speech in the very name of tolerance, diversity and acceptance which is a complete contradiction in terms". I couldn't have said it any better.